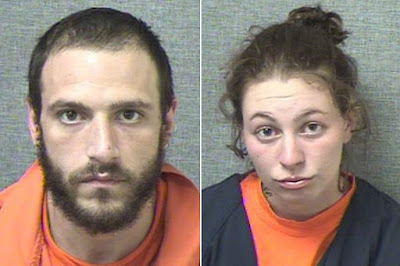 A Pennsylvania couple allegedly high on bath salts was arrested after one of them shot a gun into the sky at fireflies they thought were aliens, according to authorities. Jesse Shields, 30, and Katherine McCloskey, 22, took the drugs Saturday before terrorizing their neighbors in Lamar Township, Penn Live reported. Shields and McCloskey told police they believed fireflies in the sky were green lasers coming from extra-terrestrials. Shields reportedly fired a gun into the air to scare them away and then ran to a nearby house, according to Penn Live. He asked the homeowner to call authorities because something was after him, state police said. The neighbor told police that Shields broke the screen door with his pistol before fleeing. The couple then allegedly broke into another home, where the neighbors were awakened by the couple. Shields was screaming and McCloskey was crying in the living room, authorities said. Shields asked them to call 911 and wanted to take a shower to get rid of the “goo” that was burning his skin, Penn Live reported. Police responded to the scene and arrested the couple on burglary and drug charges.